Change difficult shots to impossible shots (unit can't be targeted at all). So a unit going to ground in the open (Exposed) wouldn't gain as much from it as a unit that's going to ground in an obscured or hidden position. All walls and hills would grant GtG to any unit fully behind them (in a top-down 2D sense). Buildings & Hills are hiding terrain. Ruins and obstacles are concealing terrain. Firing weapons lifts GtG from walls & buildings, but not hills. 'Large Targets' don't get free GtG, but can still do it as an action. Units with 'Recon' ability can lift enemy GtG instead of shooting. So even if a unit doesn't actually perform a GtG action, it would still be considered GtG if behind a wall or hill. For hills and intact buildings, this means that you would only be able to target an enemy unit from 6" away (with a +3 modifier). While for ruins, you would have to be 12" or closer to target them. If the enemy unit fires behind a wall or building, then they lose their free GtG status and can be targeted from further away as a normal difficult shot. 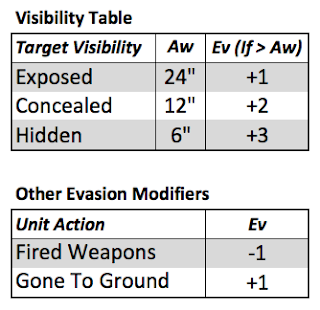 If a unit is at least 2" higher than target, their Awareness is doubled. If a unit is 6" or more higher than target, their Awareness is tripled. This would only apply to target units in woods, or behind linear obstacles. Not to targets in buildings or behind ruin walls. Models behind lower hills would lose GtG unless model is touching the back side of the hill (Hull Down). Large targets would lose GtG regardless.